I mentioned in my previous blog that I had ordered an Ancestry DNA test and would give an update and comparison once I had my results. Well the results are in, and as “luck” would have it, I’m still Irish! Ancestry did the percentages a little differently, but basically gave me the same ethnicity estimate as 23andme had reported. 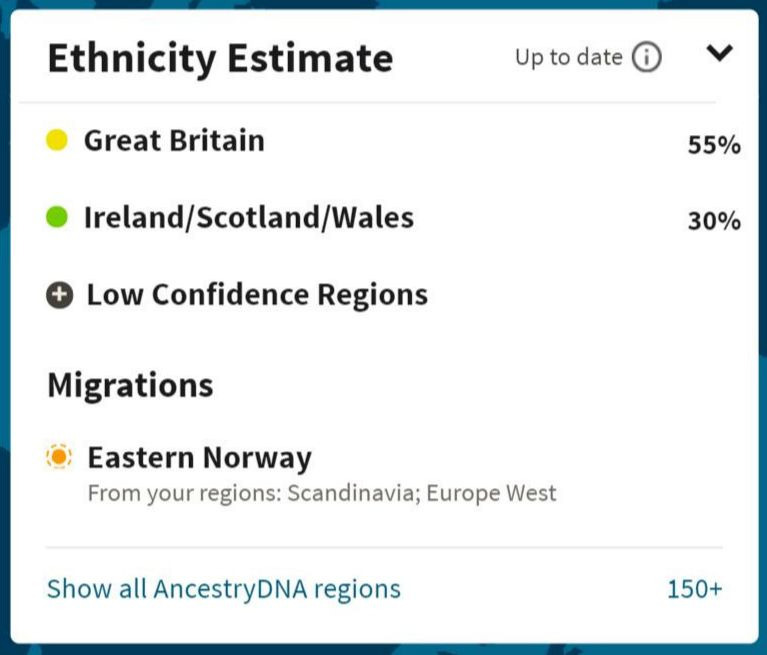 However, not to be outdone, within the same week, 23andme released a new and more specific breakdown of their ancestry report, which gave a higher indication of Irish rather than general “British and Irish,” and more Norwegian than just general “Scandinavian.” Skol! So here’s my comparison and recommendation: If you are a history buff, who mostly wants to learn more about the history of your countries of origin, and you enjoy reading a lot, you might prefer Ancestry DNA. It allows you to click on a time period, and you can see how your ancestors might have migrated to the USA (if that is your story). Ancestry DNA will also offer you more information on ancestors for a fee. I haven’t broke down and paid that yet, but I probably will as I get deeper into figuring out just how I’m related to some of these people. However, if you’re more interested in finding DNA relatives, the relative list on 23andme is more interactive. 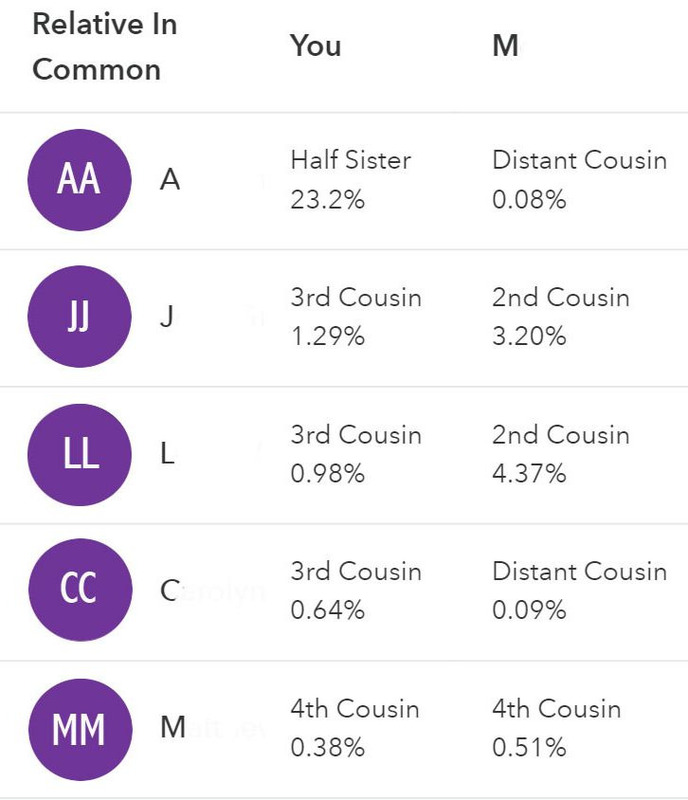 You can compare your percentage of shared DNA with a relative to other relatives on your list, so you can figure out if they are related to you through your mother or father. 23andme also offers health reports, which are neat but not necessarily medically reliable. It does ask you repeatedly if you really want to see those reports, so if you are afraid of seeing potential bad news, you can chose not to look at each individual report. I recently received a new health report for breast cancer, and of the three variants that they tested, I have none. Maybe I can cancel that mammogram I had scheduled for tomorrow! Or maybe not, as they made clear that there are about 1,000 variants, and they only tested THREE, which means I could still have 997 of them! I better get that mammogram anyway. 23andme also allows you to download your DNA file, which you can then upload to My Heritage for free. My Heritage can give you another picture of your ancestry, complete with a video graphic that includes music from your countries of origin, which was fun, as well as an additional DNA relative list. And a reminder, My Heritage is giving away 15,000 free DNA test kits to adoptees and birth family members who are searching. To qualify for a chance at a free test, you have to apply before April 30th, 2018, at https://www.dnaquest.org. I had dinner with a group of friends last week, and amazingly, all but one of them had done or had a family member contacted by someone who had done a DNA ancestry test and found relatives who had been adopted. On Saturday I was contacted by a third cousin on 23andme who is looking for her birth father. So my advice would be that if you are not open to communicating with someone showing up as a close relative, or if you have a fear of discovering family secrets you don’t want to know about, maybe DNA testing isn’t for you. However, you do have the option of opting out of the relative lists on both services, if you really just want to know your ancestry. If you were adopted or placed a child through LSS and have an interest in updating your contact information in case someone is searching for you, contact us at 1-888-201-5061 or 605-221-2346. This entry was posted on Monday, April 16th, 2018 at 3:44 pm and is filed under Adoption & Pregnancy Counseling. You can follow any responses to this entry through the RSS 2.0 feed. You can leave a response, or trackback from your own site.